Richard Thompson is an unstoppable force of nature. After several lackluster releases, culminating in the wan and pale Front Parlour Ballads from 2005, he thankfully is back in top form on Sweet Warrior, his ferocious, new endeavor. From the opening track Needle and Thread — which sends its primal, screaming vocals howling over blistering sheets of electric guitar and a thumping, percussive rhythm — it’s clear that all bets are off and that, this time, Thompson has pulled out all of the stops to craft his best album in over a decade. After almost 40 years in the music business, a time during which he has issued more than 30 outings, one would think that recording an album long ago would have become a routine exercise for Thompson. There is, however, nothing relaxed or run of the mill about Sweet Warrior. All of its songs suggest tension and struggle; they seem as if they are the result of a lengthy quest to find the right sound, the right treatment, and the right delivery. These compositions, though new, not only feel weathered, but they also feel as if they have been wrestled to the ground through continued, restless sculpting and confrontation. A wild beast lives in each of these compositions, and like a strenuous and tangled labor, they have all the black and blue marks of a difficult birth. An older, balding Englishman who cuts an unassuming figure, Thompson clearly has his own, personal Krakatoa inside of him. Playing and singing with the intensity of a singer half of his age, he rips into every song like a man on fire. Blessed with a powerful, masculine baritone that has lost none of its power — and instead has gained a nuanced perspective over the years — Thompson howls, careens, swoops, and growls his way through these tales of love, loss, and outrage, belying critics’ longtime assertions that his voice is the weakest link in his overall artistic output. Wandering through Sweet Warrior’s worlds of romance, politics, and self-doubt, Thompson’s familiar and well-trodden themes find new shades, colors, and places to explore. Primarily an electric album, Thompson’s guitar playing — which is always interesting and has influenced generations of players from Mark Knopfler to Ben Harper — has never sounded better than it does here. His ability to reinvent and augment his style of classic, English folk-meets-Sufi dance is in full evidence, and his ability to improvise and play with melodic structures rarely has been more assured. Even when the pace drops a bit, as it does in the lovely, third track Take Care the Road You Choose, there is no slack; every second of the song is taut and full of commitment. When he temporarily sets aside his electric guitar, his acoustic accompaniments are equally muscular and confident. Lyrically, a tune like Mr. Stupid would fall to pieces in the hands of a less accomplished songwriter and performer, but lines like "you’re stuck with a Neanderthal for an ex/Don’t fret about it, darling/I still sign my name on the cacaos" come tearing out of his mouth with a spot on, no holds barred delivery that defies belief. 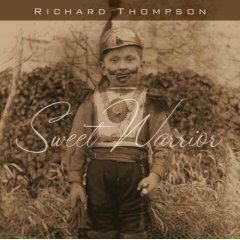 Though Thompson can sometimes be a clumsy songwriter who has difficulty finding the right voice for his compositions, the material on Sweet Warrior is reminiscent of the best of his late ’80s output. Better still, it recalls the passion of his most memorable albums — most notably 1985’s Across a Crowded Room. Indeed, the craftsmanship on Sweet Warrior often meets and raises the impossibly high bar that was created by songs such as When the Spell is Broken and Ghosts in the Wind from the aforementioned endeavor. Even when he was a young man, Richard Thompson clearly was uncomfortable with the pop milieu as well as with the demands of the "star maker machinery." As a result, he consistently has created music that was at odds with the popular trends of the day. Thompson is unequivocally a musician who is always on the move, and his sophistication and artistry have developed and ripened with only a few missteps along the way. Like Paul Simon’s Surprise and Bob Dylan’s Modern Times, Sweet Warrior is filled with the sort of mature music in which every vocal and instrumental inflection resonates and emanates from the depths of the artist’s lifetime of experience. Sweet Warrior is a strong addition to an already admirable body of work and — with the passage of time — it surely will be ranked among Thompson’s best outings. Sweet Warrior is available from Barnes & Noble.